In 1991 Toronto's own baroque opera company, Opera Atelier, made a splash with Mozart's "The Magic Flute". This production, the best I had ever seen of the work, proved that Opera Atelier could succeed not just with short, sometimes obscure baroque operas, but with one of the most beloved operas ever written. After securing sponsorship from a major European bank, their fortunes have risen ever since culminating in a spectacular production of Lully's "Persée" last year. Now, ten years later, the company returns with a new production of "The Magic Flute". This time, instead of the excitement of discovery, a certain dullness seems to pervade the production. This is the result of director Marshall Pynkoski's decision to include all of librettist Emanuel Schikaneder's spoken dialogue for this "Singspiel" albeit in Andrew Porter's witty English translation. Most productions in German cut as much of the dialogue as possible both because most people prefer to hear more "Sing" and less "Spiel". It is admirable and instructive to present the work uncut. We are given a more accurate view of what this "play with songs" must have been like at its première in 1791 and we get a fuller view of the characters, but the work as a whole loses its intensity. The difficulty Pynkoski encounters is in not being able to maintain the momentum generated in the music through the spoken sections. If the full dialogue is to be included its pace has to be snappier and more inventively staged if the work, now three hours long, is not to bog down. What saves this "Magic Flute" from the constant threat of torpor is the amazing performance of Daniel Belcher as the bird-seller Papageno. Belcher is so perfect, I now cannot imagine anyone ever performing this role better. Not only does Belcher have a rich, deep baritone but he is a superb comic actor. On top of that, Pynkoski has had the brilliant idea to assign Papageno balletic leaps and birdlike gestures thus finally making sense of the libretto's description of him. Belcher is lithe and nimble enough to encompass this added layer of physical movement with ease. Papageno is called a "child of nature" and for the first time I saw someone fully bring out this character's childlike attitude and link to the natural world. How exciting it is to see a classic role so fully realized! Belcher's energy level and commitment to the role, however, are several degrees above those of the remainder of the cast. Closest to him in these are Peggy Kriha Dye, Krisztina Szabó and Vilma Vitols as the Three Ladies. Not only do their voices blend beautifully but their continuing rivalry for Tamino's attentions is genuinely funny for a change. Otherwise a sense of routine creeps into some performances. Soprano Meredith Hall (Pamina) produces a beautiful tone but little sense of passion or involvement. The same is true of Gary Relyea (Sarastro), who must hold the record for the number of times he has performed this role in Canada. Coloratura Erin Windle's underpowered "O zitt're nicht" in Act 1 does not bode well, but she rallies for the showpiece "Der Hölle Rache" in Act 2 including baroque trills in the famous staccato sections. She seems, however, to be giving a concert performance in fancy dress giving no hint that she is playing a character much less a menacing one. Tenor John Tessier (Tamino) sings with little nuance or variation in dynamics, capturing the Prince's youthfulness but none of the nobility of emotion meant to contrast him with the natural man, Papageno. Gerald Isaac played the lascivious Moorish servant Monostatos back in 1991. There is now little tone left in his tenor and his energetic acting jars with the rest of the production seemingly based more of Saturday morning cartoons than on baroque acting principles. Michael Meraw (the Speaker) is lacklustre and Gillian Keith (Papagena) has a lovely but small voice that seldom travelled beyond the orchestra. The production design is even more sumptuous and inventive than it was in 1991. Set designer Gerard Gauci has taken to heart the opera's pseudo-Asian setting with architectural references to a wide range of styles. Especially effective are the scrim showing detail of a baroque painting of clouds behind which the Queen of the Night appears, the vaulted prison where Papageno and Tamino are tested, the three temples each with their hidden animals and the flying gondola carrying the Three Genii who lead various characters to reason. Gauci also makes explicit the libretto's implicit imagery of Freemasonry. By using exquisitely painted drops, the frequent transformations the libretto demands are accomplished in an instant. If Gauci's sets reflect the diverse elements that make up the plot, Dora Rust-D'Eye's costumes provide a sense of unity by picturing Sarastro's court as the seat of the Ottoman empire. The traditional co-ordination of future mates' costumes (Tamino and Pamina, Papageno and Pagagena) is a delight and the linking of Sarastro's court colours of blue and gold to the slowly revealed backdrop at the end produces a stunning visual climax. Kevin Fraser's sensitive lighting recreates the ambiance of a candle-lit stage. And yes, that wonderful dragon of 1991 is back. David Fallis, conducting the Tafelmusik Baroque Orchestra, chooses tempi sometimes faster than usual (as in Papageno's "Der Vogelfänger bin ich ja"), sometimes slower (as in Pamina's "Ach, ich fühl's"), in an effort to emphasize the broad diversity of the musical sections separated as they are by wider than usual swaths of dialogue. This visually delightful production should serve Opera Atelier in good stead for a long time to come. Let's hope, though, that on its next appearance, Pynkoski can muster a more emotionally involving group of singers. And please, when you next revive this production, bring back the marvellous Daniel Belcher as Papageno. 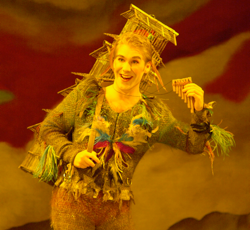 Photo: Daniel Belcher as Papageno. ©2001 Bruce Zinger.